Breisch & Crowley - The solution you need to help your residential or commercial design and construction project run as smoothly as possible. By focusing on teamwork and by bringing the designer and contractor together early in the process, we work with you to help make your dreams become a reality. We can also work on your project utilizing the traditional Design - Bid - Build approach. With either approach we can assist by helping you to properly plan your project and ensure that the process from design concept to completed construction flows as smoothly as possible. At BC Design / Build we would like to partner with you any time you start thinking about your next construction project. Professional design and construction administration are our specialties. We perform these services with integrity while providing open and honest communication. We can deliver to you our superior design services for a wide range of project types. 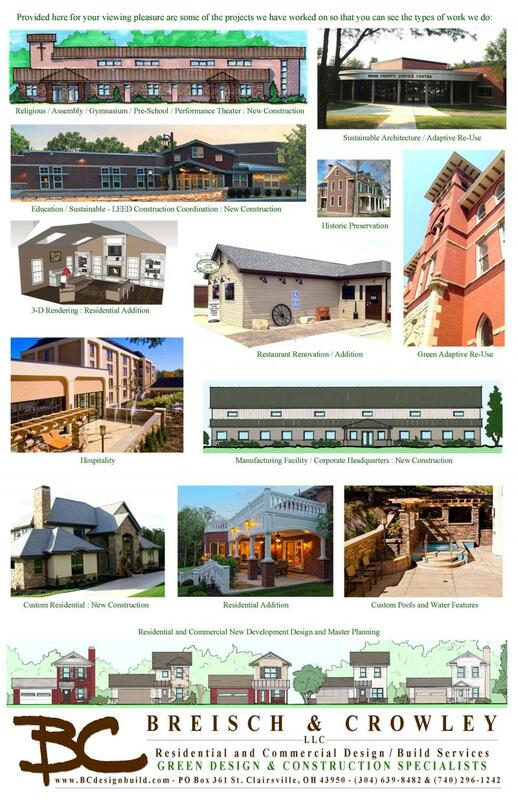 Some examples of our work and the kinds of projects we can help you with are shown above. BCdesignbuild – Call us Before Construction.